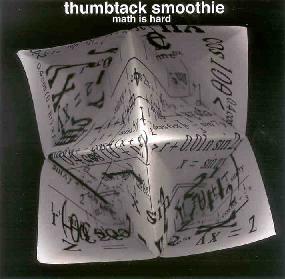 Thumbtack Smoothie - "Math Is Hard"
Math is Hard is an intense look at the experimental music scene through the eyes of San Francisco based Thumtack Smoothie. The mix is obscure and damaging to those who like an easy listen. It steps over into the realms of noise and smiles as it moulds sound into chaos, building to a pinnacle and staying there. The basis for the tracks lie in the computer era, the sample kingdom. Most of these twelve phases are created in what sounds like that manner. I could be wrong, but most sounds programmed. It has traits of Aphex Twin, Square Pusher, and Red Snapper, and it will court the ears of Drum & Bass/HipHop/Noise/Trance freaks piled up to the eyeballs. It haunts the minds of those who have no idea as to what it is about. It rests mainly in experimental creations, haunting atmospheres and bleeping backgrounds. Math is Hard has no place in spacerock whatsoever, though it bears some relevance to noise/head music and is deeply orientated by the whole Drum & Bass scene. Roni Size or Goldie fans may approve. I on the other hand find it too much hard work to listen to. It is creative in its workings and the production is good. The sound quality is faultless and the length is worthy. I just do not find this type of music inspiring, it is rather dull and monotonous. Those of you who listen to Breakbeat stuff or drool at the thought of Drum & Bass, or maybe just like to explore the sounds of new music, then you will definitely get off on this. People who want proper music run a million miles. Contact via snail mail c/o Manic Obsessive/Quaketrap Recordings; 9 Perego Terrace; San Francisco, CA 94131.